The Jessie Ball duPont Fund works to build assets, expand access, and create opportunities for organizations and communities primarily in Florida, Virginia, and Delaware. The Fund focuses its resources around organizational capacity building, building the educational, cultural, health, and financial assets of communities in need, and strengthening civic engagement. In 2017, the Fund granted approximately 146 grants, totaling nearly $5.4 million. “With Fluxx, everything is centralized and everyone has insight into their day-to-day work in ways that they never had before.” - Mark Walker, the Knowledge Management and Technology Officer for the Jessie Ball duPont Fund. 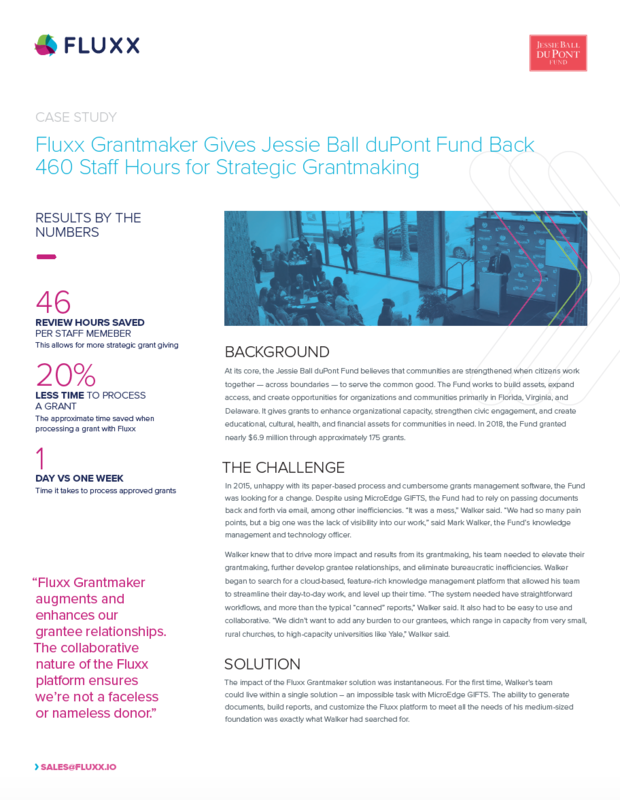 Download the complete case study to learn how the Jessie Ball duPont Fund uses Fluxx Grants Management Software to streamline their grantmaking process today.